This is a Digivice Guide for the Digivice D3 15th Anniversary (Japan Version), The D3 has been rebuilt. Over 150 different Digimon are included, and over 80 can be raised from eggs. They include the strongest Digimon , Imperialdramon (Paladin mode) and Armageddemon. Let’s start this simple guide. For ok / confirm navigation, also allows you to see your Digimon’s type, stats, and win. For return/back navigation or cancel command, also allows you to see the map and steps. Press this button when your D3 turns off to awaken it or use it to turn off the screen. Tap Right for navigation to menu options, tap left for the clock. * On the top of your D3 is the prongs and two risen parts of the D3. That’s for connecting with other Digivices, D3s or not. * On the back is the clip and where your battery is. The battery is a 3V CR2032 just like another 15th anniversary digivice. * There’s a tab on the back you have to remove before anything and when you do, the game will beep for a moment before asking you to set the clock and then you’ll see Demi Veemon turn into Veemon! V-mon, Hawkmon, Armadillomon, Patamon, and Tailmon are all available from the beginning. Wormmon is not available after clearing area 7. V-dramon is available after area 28 is cleared (?). Needless to say, the ideal is to be Vaccine in the morning to Virus at night. Each segment (Vi, Da, Va in that order) has 5 bars each and if you win 5 battles, you’ll drop down a segment. At this time, I don’t know how to recharge the bar for typings or anything or change typings than winning lots. Next, hitting A again will let you see the Digimon’s stats, HP, AP, and DP. HP is hit points or health points, AP is attack power, and DP is digimon power. Through training (which I will discuss later), you can work on increasing a digimon’s stats. But how do you increase or lose DP? With that, hit A to go to the Win screen. With that, you can see how many wins so far you’ve gotten with a certain digimon. With that, you’ll be taken back to the digimon select screen. Hit B to exit or L/R to select another digimon. With the map this time, they moved the pedometer together. So hitting B on the main screen shows you the map. You can hit A then use L/R to select the location and move there. Hitting B shows you first the number of steps left in the area, then hit it again to see the steps you’ve taken total. Due to how sensitive the pedometer is, you can shake it to record steps. Hit B to exit or wait a couple seconds and it’ll automatically return you. To check the clock, hit left. Exit out, wait a second or hit left again. To turn sound on and off, hit A+B at the same menu and you’ll get a menu asking you yes or no. Hit No to turn off the sound and yes to turn it on. This is the screen you can check any digimental’s progress you’ve collected on the way. The way this work is after collecting a “crest” or a fragment of a digimental (each area has a different piece you can scan for of the 8 crests) and when you put 3 of these together, you’ll get a digimental that is usable between all the digimon. Note: You can only have 3 Digimentals of the same kind. Any extra Digimentals are thrown away. With training, you can practice battling, where you can practice V-Action and P-Action battles. P-Action is where you shake the digivice as fast as you can. V-Action is when you mash A as fast as possible. First thing you’ll select is the digimon you’re training, then you’ll select the mode Pendulum (Top) or Mashing (Bottom). Then train that digimon! Depending on how well you do, you’ll be able to fire no to 5 shots. I was at first thinking with the number of shakes there was a correlation with the number of shakes to shots fired but it doesn’t seem to be the case. Usually however 25+ shakes for Pendulum is required for 5 shots, but it could be luck. With mashing, I found around 18-21 gets you 4 shots, 16-18 gets you 3 shots. I need confirmation though. Note: P-Action is for training Vaccine and Data digimon and V-Action is for training Virus Digimon. Scanning is the replacement for the Help Wave. In this mode, you’ll scan for different digimental pieces (AM Radios and older TVs seem to be the best for this trick, however I had luck using my cellphone) and each map has 4 different symbols you can scan for. Using this, you’ll be able to create digimentals from the fragments gained here. Unlike the older D3s, you can scan for miracles now too. Sometime, you’ll run into digimentals than just a fragment by encountering the specific digimon that relates to it (Agumon = Digimental of Courage) or battle a digimon that drops it (Ninjamon drops Purity/Sincerity). Through scanning, you may gain multiple digimentals and you can trade them away in communication. 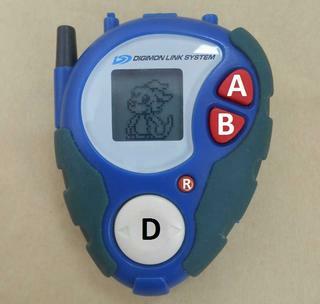 Trade (Digi eggs) Battle is where you can connect your D3 with a Digivice or another D3 and well, battle. Trading is where you can drop off Digi Eggs and the empty boxes are there for collecting them. Obviously, your options all depend on what you’re connecting to. Another D-3 or a Digivice or a Pendulum. I don’t know what the digimon option is however. Before you battle, you’ll have these options in this order: Attack, Digimental Up, Switch, Evolve. Digimental Up is if you have a Digimental, Switching is switching the digimon in battle, Evolve is self-explanatory. All the battles before you connect are mashing A as fast as you can, then when you see the connect screen, connect the two digivices with the prongs touching and hit A. From there, battle will commence and someone wins. Yaaaaay. With Trading, you connect to another D3 after you select a Digimental/Empty Box. The empty box is to recieve a digimental that doesn’t appear while selecting one will give one to someone.You can lose your last of a digimental this way as you can have multiple of one. When you’re defeated in battle, you’ll have to heal V-mon/Wormmon before getting steps or doing anything else. You can’t do anything while they’re injured. Battles are akin to how I explained earlier but there’s a difference in the way you battle base on what type your digimon are. So if you’re wondering why the battles aren’t working out the way you expect, check your typing! Every Digimon has access to the Digimentals usable so you’re NOT just stuck to the anime forms! This mean for 10 armor forms per partner (excluding V-Dramon) meaning access to 85Digimon total if I’m correct. That’s a lot of digimon. In sense, you’re going to want to pick apart the Digimon and their evolutions. Veemon: HP: 6, AP: 1, Mega hit: 6, 14, 23. XV-mon – HP: 9, AP: 2, Mega hit: 6, 23. Paildramon (Have access to Wormmon and XV-mon) – HP: 12, AP: 3, Mega hit: 6, 23. Imperialdramon (???) – HP: 14, AP: 3, Mega hit: 6, 23. Fladramon (Digimental of Courage) – HP: 10, AP 2, Mega hit: 6, 23. Lighdramon (Digimental of Friendship) – HP: 9, AP 2, Mega hit: 6, 23. Magnamon (Digimental of Miracles) – HP: 13, AP 2, Mega hit: 6, 23. Setmon (Digimental of Love) – HP: 9, AP 2, Mega hit: 6, 23. Yashamon (Digimental of Purity) HP: 9, AP 2, Mega hit: 6, 23. Honeybeemon (Digimental of Knowledge) – HP: 9, AP 2, Mega hit: 6, 23. Depthmon (Digimental of Sincerity) – HP: 9, AP: 2, Mega hit: 6, 23. Sagittarimon (Digimental of Hope) – HP: 9, AP 2, Mega hit: 6, 23. Gargomon (Digimental of Light) – HP: 9, AP 2, Mega hit: 6, 23. Kangaroomon (Digimental of Kindness) – HP: 9, AP 2, Mega hit: 6, 23. Wormmon – HP: 5, AP: 1, Mega hit: 5, 23. Stingmon – HP: 10, AP: 2, Mega hit: 5, 23. Dinobeemon (Have access to V-mon and Stingmon) – HP: 11, AP: 3, Mega hit: 5, 23. GranKuwagamon – HP: 13, AP: 3, Mega hit: 5, 23. Shadramon (Digimental of Courage) – HP: 8, AP: 2, Mega hit: 5, 23. Togemogumon (Digimental of Friendship) – HP: 8, AP: 2, Mega hit: 5, 23. Kongoumon (Digimental of Miracles) – HP: 12, AP: 3, Mega hit: 5, 23. Owlmon (Digimental of Love) – HP: 8, AP: 2, Mega hit: 5, 23. Nohemon (Digimental of Purity) – HP: 8, AP: 2, Mega hit: 5, 23. Searchmon (Digimental of Knowledge) – HP: 8, AP: 2, Mega hit: 5, 23. Archelomon (Digimental of Sincerity) – HP: 8, AP: 2, Mega hit: 5, 23. Bullmon (Digimental of Hope) – HP: 8, AP: 2, Mega hit: 5, 23. Coatlmon (Digimental of Light) – HP: 8, AP: 2, Mega hit: 5, 23. Puttimon (Digimental of Kindness) – HP: 8, AP: 2, Mega hit: 5, 23. Valkyrimon – HP: 14, AP: 3, Mega hit: 5, 23. V-Dramon is obtainable after clearing Area 27 and you’ll be able to have access to UlforceV-mon after meeting the WIN requirement. After gaining Wormmon, you’ll get the Digimental of Kindness right away. After area 7, connect your D3 to a 15th Anniversary Digivice in battle and the Crest of Courage will transfer. This will unlock the menu option to gain Imperialdramon Paladin Mode on the D-3. To unlock Imperialdramon Paladin Mode, on Map 26 or 27, scan until Omegamon shows up to give you a sword. You will have then unlocked Imperialdramon Paladin Mode. At first, I didn’t think you steps recorded if you woke the digimon up and walked but it turns out that’s possible. While they do sleep at the times listed, you can wake them up by hitting B and shaking the digivice and/or walking around. Meaning you’re not limited by sleep cycles as you were with the Original 15th Anniversary Digivice. jasiad for this awesome guide. xshinox for help in comments in this and another thread. thehumulos for their manual translation! The File Island for their D-3 guide on the original D-3 and digimon stats.